Autumn arrangments are easy and fun to design. The season offers rich colors and ornamental vegetables, making this an easy DIY project for your Fall table. My inspiration for this centerpiece comes from the beautiful ornamental cabbages that the season brings. The rich purple and green color of the wide leaves makes this an impressive decor element for a Fall centerpiece. Today I will show you how to make a beautiful centerpiece for your table, these cabbages can be used outdoors as well. Recently, I purchased this basket from a flea market with the intent of filling it with all kinds of Fall goodies. You can find a similar basket HERE, HERE and HERE. The basket has a weathered look to it, as it had been outside for some time before I brought it home. I took my empty basket to our local nursery and searched for Fall foliage to use in my arrangement. It’s a good idea to take the basket with you when shopping for plants, so you appropriately fill out the basket, based on its size. It also allows you to play around with different plants to see what the arrangement will look like when the basket is full. When I got to our nursery, a very nice gentleman who works there showed me all my options. He pointed out the ornamental cabbages, mums, peppers, and small ornamental plants that were tucked in the back of the nursery that are often overlooked. I recommend asking for help when you go to your nursery, for suggestions and ideas. Going to the nursery early in the season ensures you get first pick of the harvest. I had a great selection when I went – items were just arriving to the nursery. The basket I am using is fairly large so it requires more plants, a smaller basket would require fewer plants. Make sure your basket is deep enough to hold the plants and the basket is slightly taller or roughly the same height as the pots. I choose rich colored snap dragons in deep pink and yellow. They add a beautiful burst of color to the arrangement. The focal point of the centerpiece is one large ornamental cabbage. I started by lining the basket with plastic, I used a trash bag and tucked in the corners when the arrangement was complete. Starting with the largest plant, the main focal point, I placed it towards the edge of the basket, not in the middle (even though it looks like that in the picture). Next, I added the smaller 2 cabbages and kale, in a triangular pattern, along the edges of the basket. Depending on the height of your basket and the height of the plants, you may need to raise them up a bit. Use a cup, small box or other item to give your smaller plants some height. After the cabbages and kale were placed in the basket, I added the snap dragons. Fit the plants in tightly to the basket. The fuller the arrangement, the better it will look. Intersperse the 3 red pepper plants into the basket, filling in gaps. The shorter plants can be stacked on the rims of the other plants, filling in gaps like I did with these dusty miller plants. Continue adding all plants focusing on filling gaps. I love the basket on the kitchen island, it really brightens the room. I added a white pumpkin to fill in a small gap. If you have herbs in the kitchen that you use regularly, add them to your arrangement. You can substitute another plant for the herbs or add them in addition to the others. I added a basil plant to this centerpiece and tucked in mini pumpkins and dangling grapes. I am using the arrangement in my dining room, on the sideboard. It adds a real feeling of Fall to the space and looks stunning. You can read more about the tablescape I created for the Dining Room HERE. For more Fall decor inspiration, check out these posts. I’m so happy you stopped by and I hope you are inspired to create a Fall centerpiece for your Home. 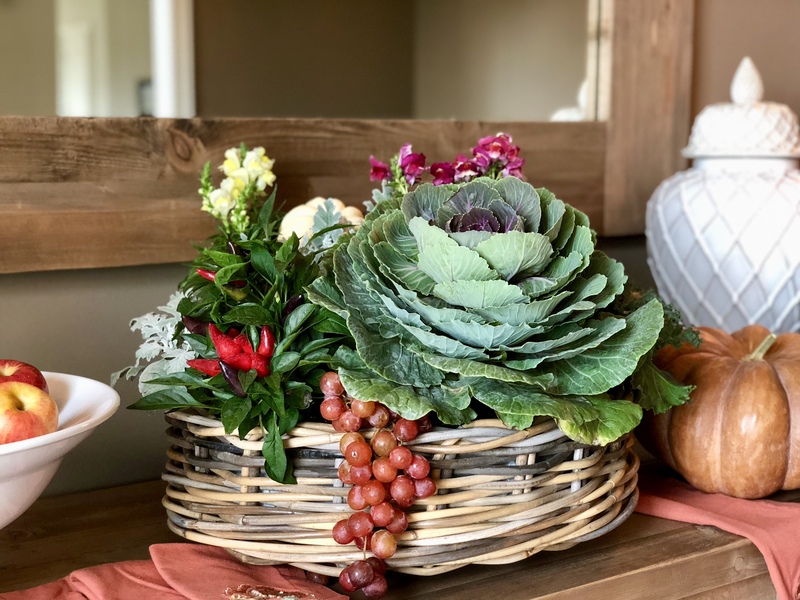 Tag me on Instagram HERE if you create a Fall Cabbage Centerpiece with ideas from this post. I’d love to see your arrangement! That’s a beautiful arrangement, Denise. You left the plants in their pots – is it hard to water them individually? Do you keep adding grapes when they go bad (or someone eats them)? You are so welcome Lynn!! I hope you make one for your beautiful table! I love this arrangement. ‘Can’t wait to try it for my kitchen island. I’m always struggling with what to put there. Thank you! I’m glad you like it, so many options at this time of year, with all the natural Fall elements available. It’s a beautiful and fantastic idea of using fruits and veggies into such a lovely arrangement! Thank you! It really looks beautiful too!